The ASPA certification program is used by individuals, schools, and print shops throughout the world. We recently certified the 1000th person in our program. Printing T-shirts is a great way to make money. We show you how! All you need is a computer and internet access--no printing equipment necessary. 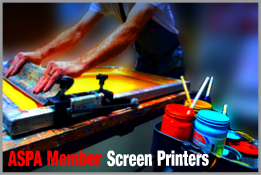 Training course includes ASPA Certified Screen Printer exam at no extra charge. ​"We are a screen printing company based in India. The Diploma in Screen Printing course really helped to take my business to the next level as I was depending on others to run my business. Now I am fully equipped to control it myself. This course is an eye opener for me. It's great value for money." Includes ASPA Institute's Diploma in Screen Printing course. Schools throughout the USA use the ASPA Lesson Plans. ASPA's 'Lesson Plans for Teaching Screen Printing' will guide you step-by-step in teaching the screen printing process to your students or employees. Our lesson plans make teaching screen printing so much easier than having to start a training program from scratch. Should I Start a Printing Business in 2018? Useful news for printers. And FREE Giveaways!